The celebration of the 500th anniversary of the birth of St Francis Borgia (Gandia 1510 – Rome 1572), the last of the illustrious members of the “Borgia Dynasty,” prompted us to embark on the present historical and musical project, recalling the most significant events of the age in which the chief protagonists of this extraordinary and fascinating family lived: Alfonso de Borja (Callistus III), Rodrigo de Borja (Alexander VI), Giovanni Borgia, Cesare Borgia, Lucrezia Borgia and St Francis Borgia. 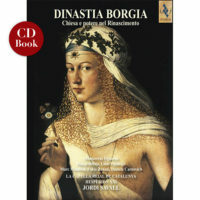 Few historical figures have suffered such a systematic and enduring deformation of objective reality as the Borja/Borgia family, and particularly Alexander VI and his two most famous offspring – Cesare and Lucrezia. And few provide such a stark and extreme illustration of the fraught relationship between the Church, as an institution, and the spheres of secular and spiritual power, especially at a time when European society was witnessing an explosion of artistic activity and a spectacular new spiritual and intellectual debate inspired by the discovery of Greek civilization, which was to crystallize in humanist thought and a creative development which shaped the emergence from the medieval world to a true cultural and social Renaissance.